Business processes provide abstractions for modelling business protocols that define the correct interactions between two or more Web services (WS). It has been shown that it is possible to automatically derive role-specific processes from a global protocol definition and also statically verify the compliance of a local process with the corresponding global business process. In this paper, we show that a similar approach can be used at run-time. 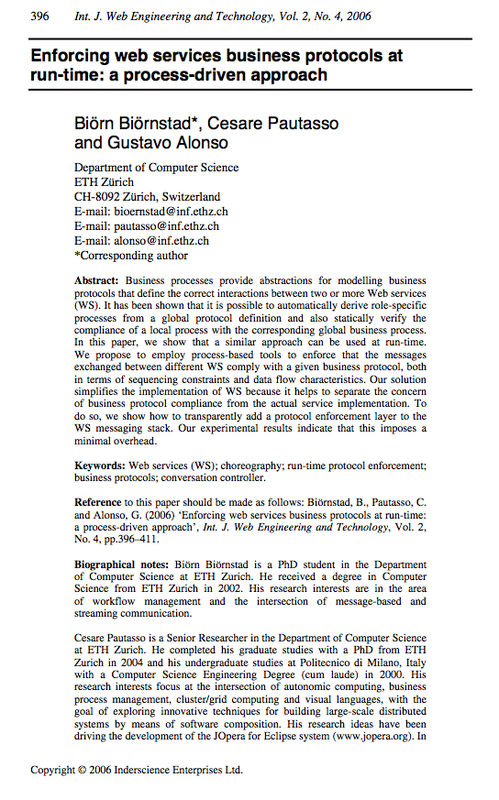 We propose to employ process-based tools to enforce that the messages exchanged between different WS comply with a given business protocol, both in terms of sequencing constraints and data flow characteristics. Our solution simplifies the implementation of WS because it helps to separate the concern of business protocol compliance from the actual service implementation. To do so, we show how to transparently add a protocol enforcement layer to the WS messaging stack. Our experimental results indicate that this imposes a minimal overhead.